At the identical price point, who delivers the best combination of sport and luxury? 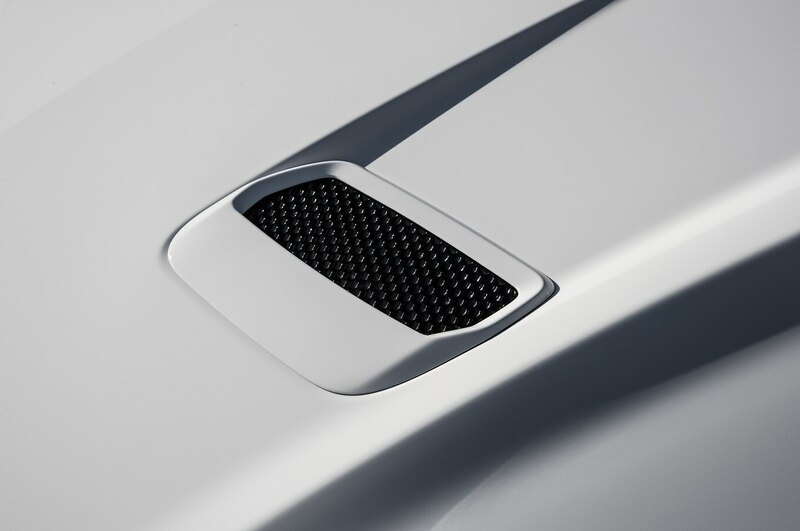 We ask our vehicles to be good for multiple uses, but few are asked to do such disparate duties as luxury sports cars. They need to ride nicely but handle well. 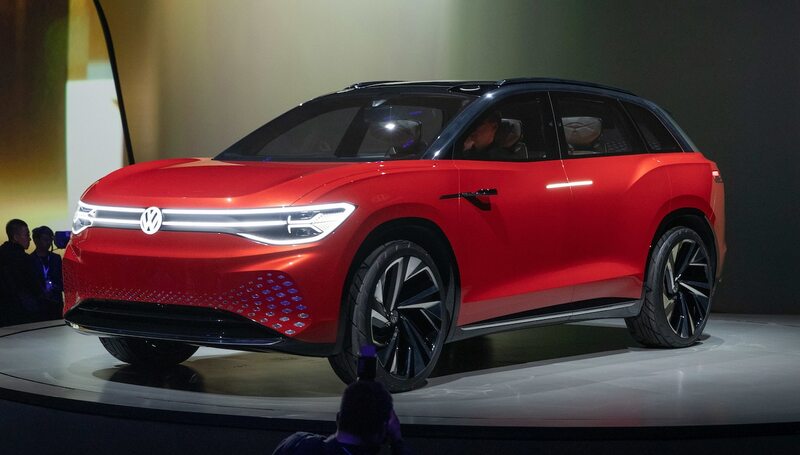 They need to have quiet interiors but aggressive exhaust notes. They need to be light and nimble but come with fancy materials and loads of features that add weight. Everything ends up being some kind of trade-off. The more money you can throw at the problem, the fewer compromises you need to make. But this test is specifically about not throwing money at the problem. 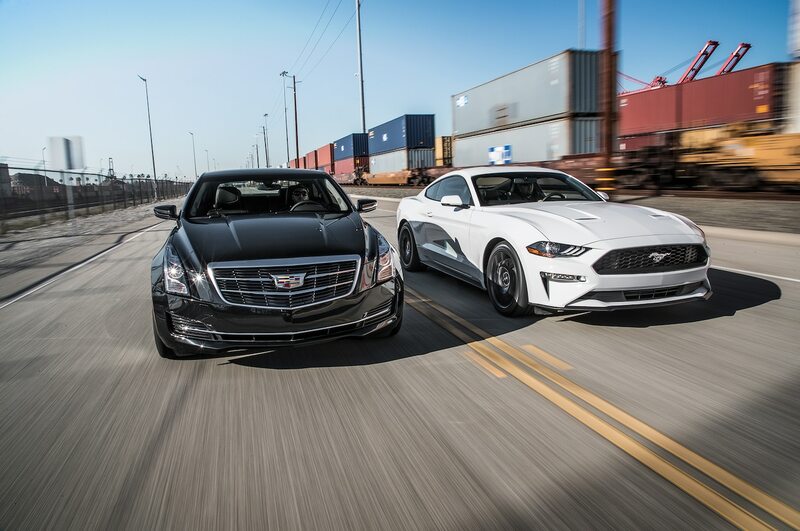 With a $40,000 USD price cap, we find ourselves with the keys to a 2018 Cadillac ATS 2.0T coupe and a 2018 Ford Mustang EcoBoost, both just squeaking in as tested. 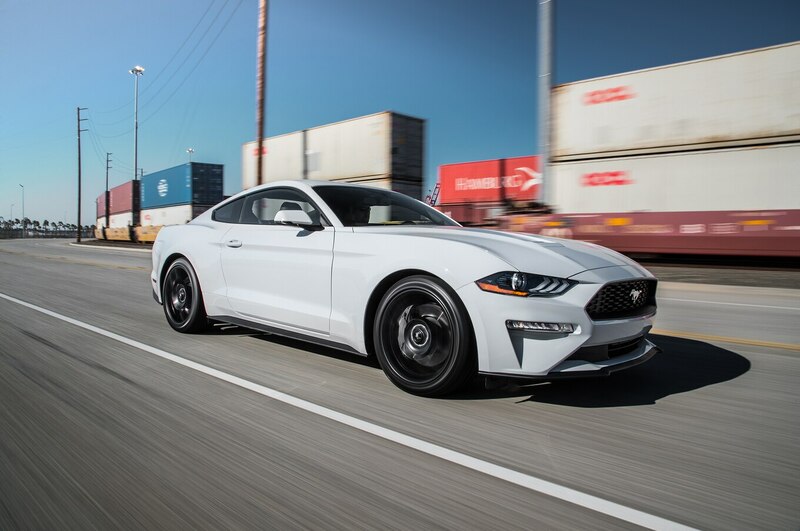 Although both cars can be had with a manual transmission, we opted for automatics because this is a consumer test, and the vast majority choose automatics. Before we get into this, though, let’s usher a couple elephants out of the room. 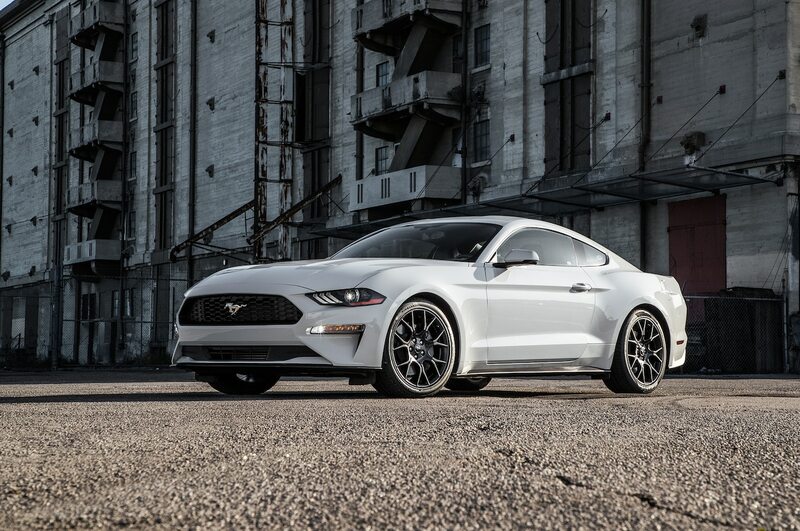 Yes, for this money, you could get a Mustang with a V-8. 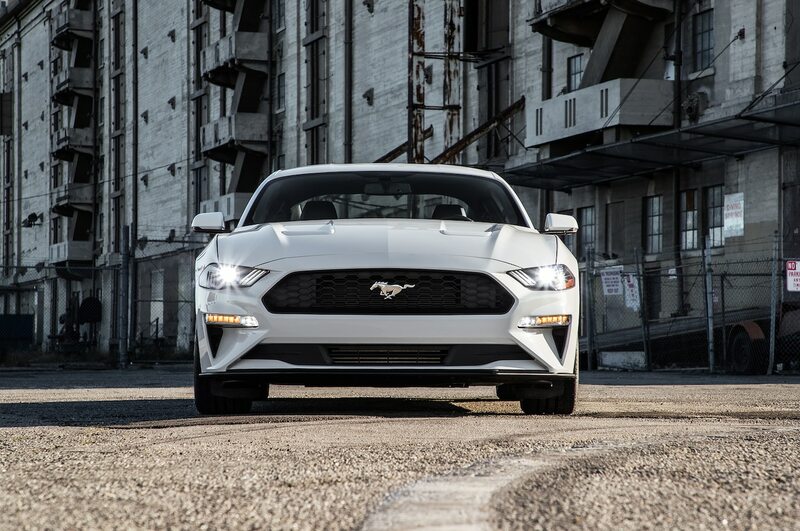 Besides being wildly unfair pitting a V-8 against a turbo-four, speccing the bigger engine would mean we couldn’t afford many luxury features with the Mustang, and that’s the whole point of this comparison. 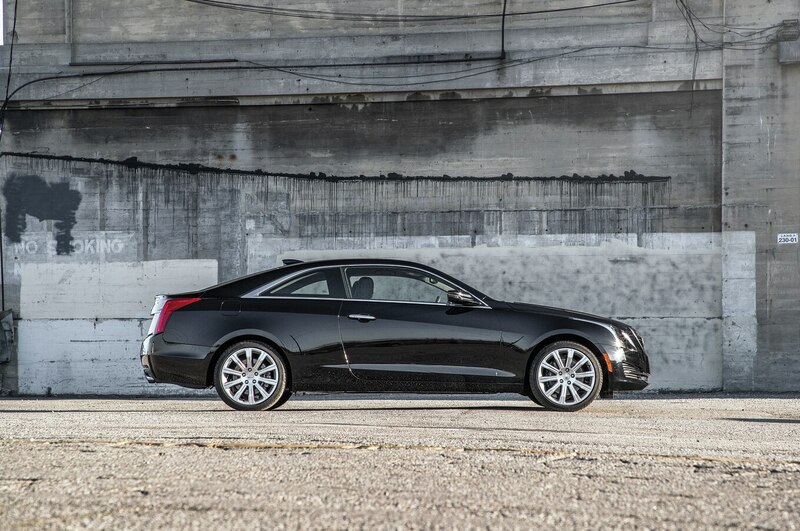 Meanwhile, most folks don’t associate Cadillac with “sporty” until you get to the V-spec models. 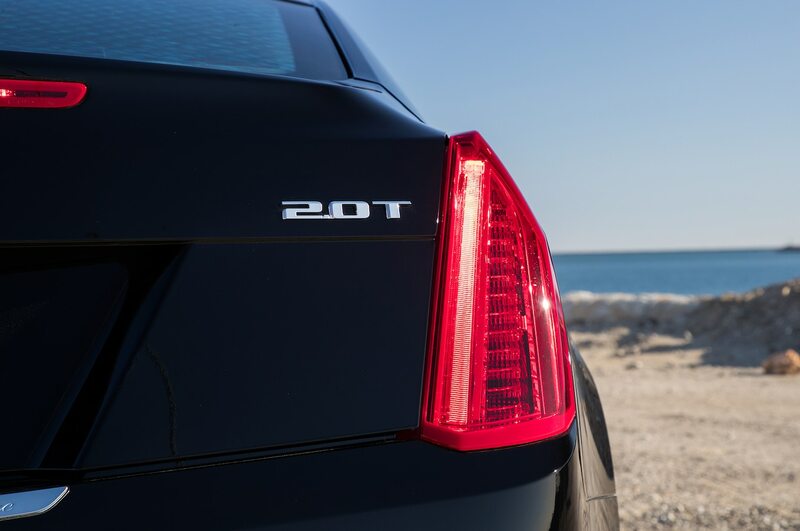 But the ATS is positioned as a sporty coupe. And that means going up against cars such as the Mustang. We eagerly anticipate your outraged emails. As configured, these two cars are pretty similar. 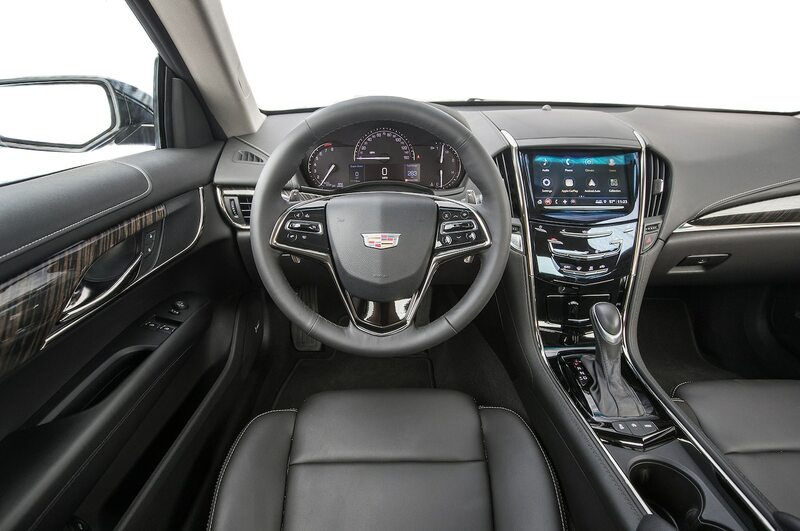 The Cadillac is slightly smaller and notably lighter (nearly 300 pounds (136 kg)) with a tighter front seat and smaller trunk. It even rings up cheaper at $39,490 USD to the Ford’s $39,880 USD. 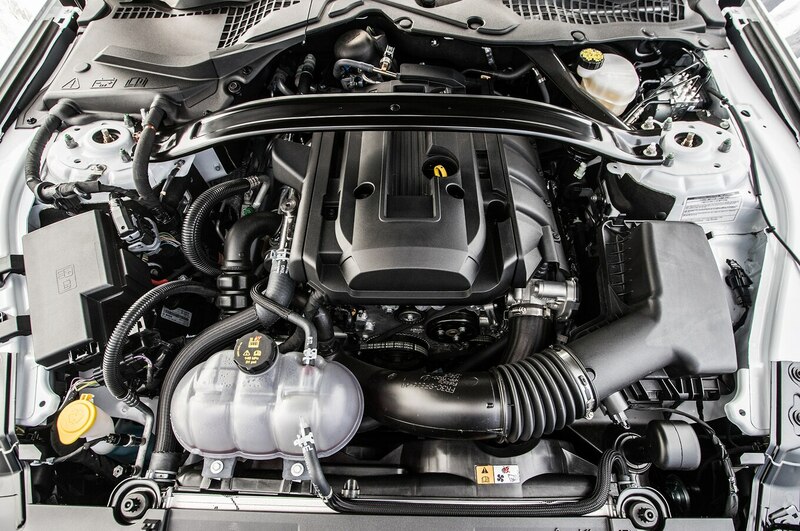 The Ford fights back with a more powerful engine and subsequently a better power-to-weight ratio, yet it still manages to match the Cadillac’s fuel economy. In standardized testing, though, it’s anything but a draw. 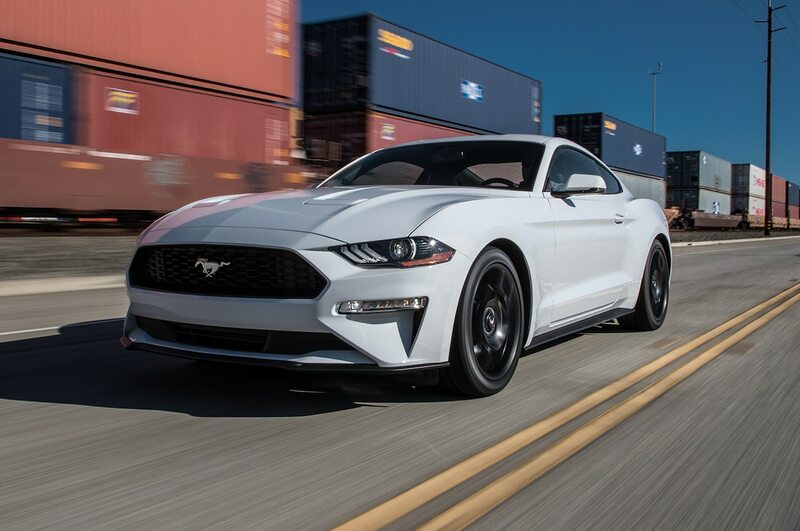 The stronger, heavier Mustang is quicker to 60 mph and through the quarter mile, though the ATS nearly caught up by the end of the drag. 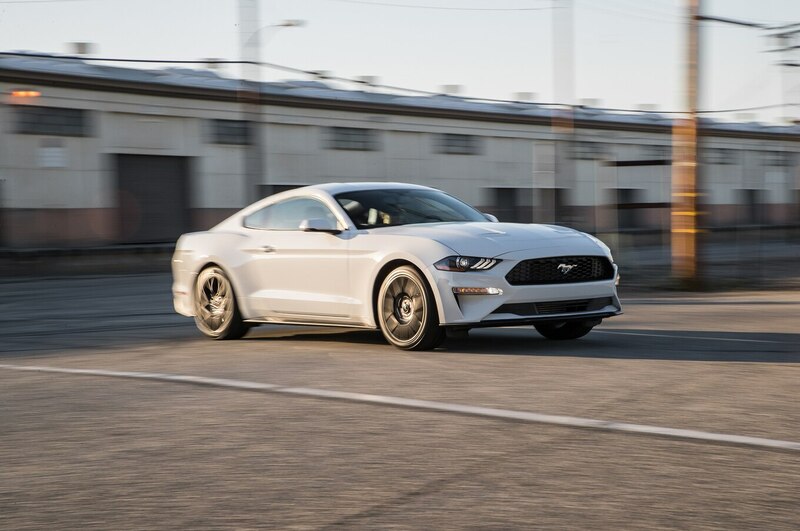 The Mustang stops 8 feet shorter from 60 mph, pulls higher average g on the skidpad, and laps our figure eight test quicker and at higher average g. Also, the Mustang sounds better. 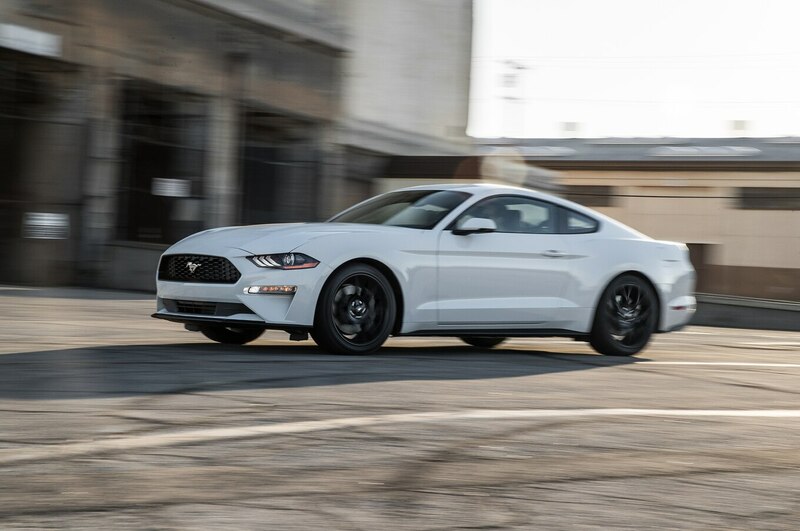 Although the raw horsepower and torque of the EcoBoost engine can be credited for the speed advantage, it’s the tires that make the difference in most of the testing. 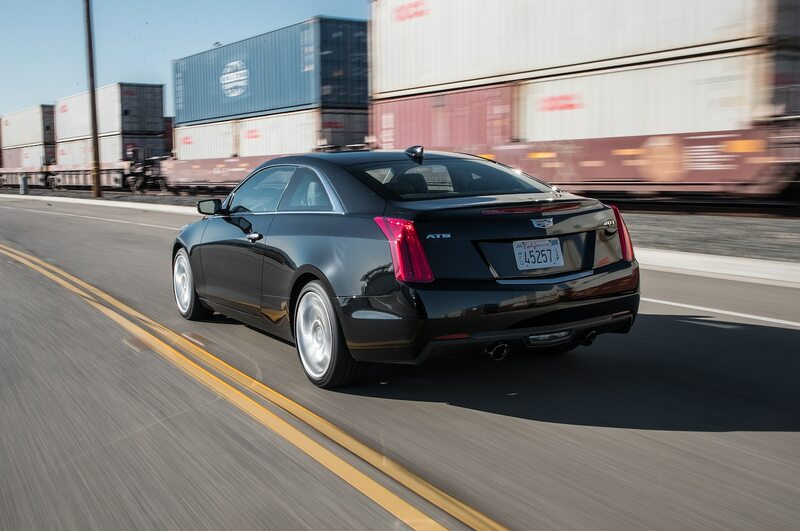 The Cadillac—with zero window sticker options to keep it price competitive—rides on Continental ProContact all-seasons. 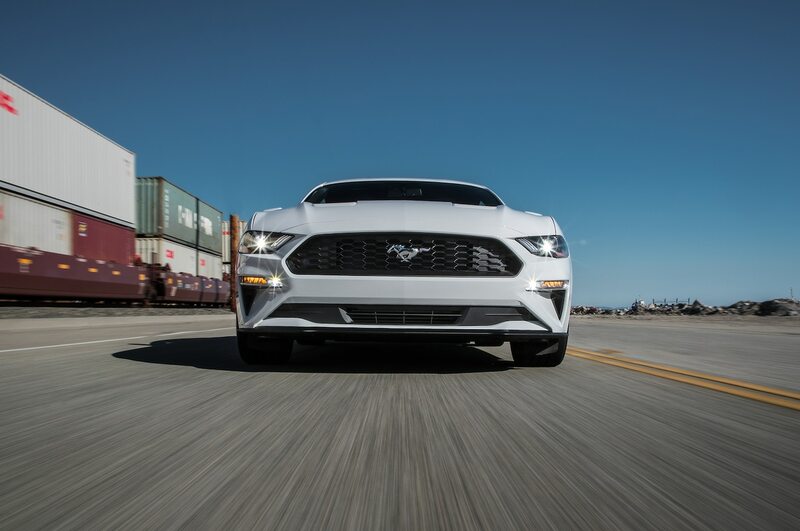 The Mustang, meanwhile, is equipped with the EcoBoost Performance package, which among other things buys you a limited-slip differential and Pirelli P Zero summer performance tires. The tire discrepancy made itself known during our evaluation. 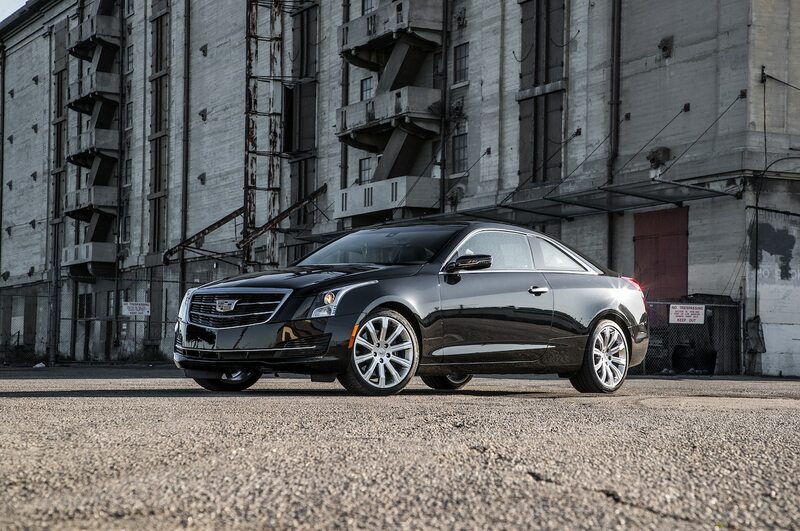 The Cadillac has a wonderful chassis, but it doesn’t work with these tires. Attempting to drive aggressively gets you a handful of understeer as the tires quickly cry uncle. OK, slow in, fast out, right? Nope. 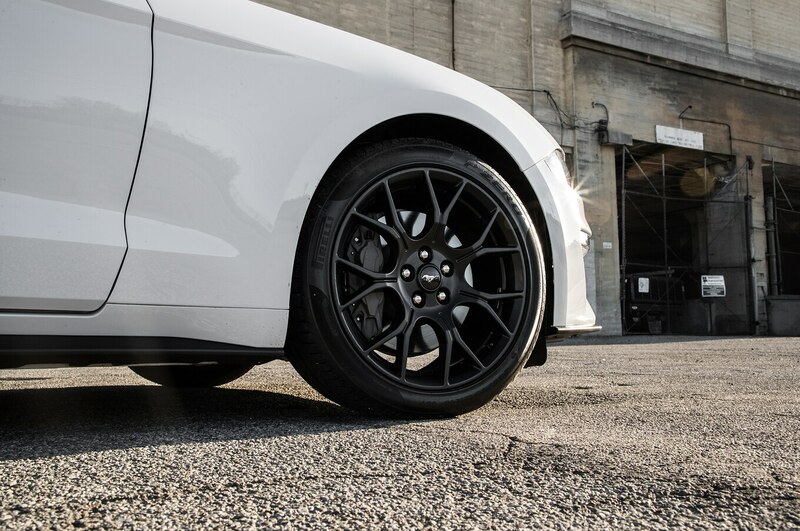 The tires can’t put the power down, either, so you get draconian traction control intervention. 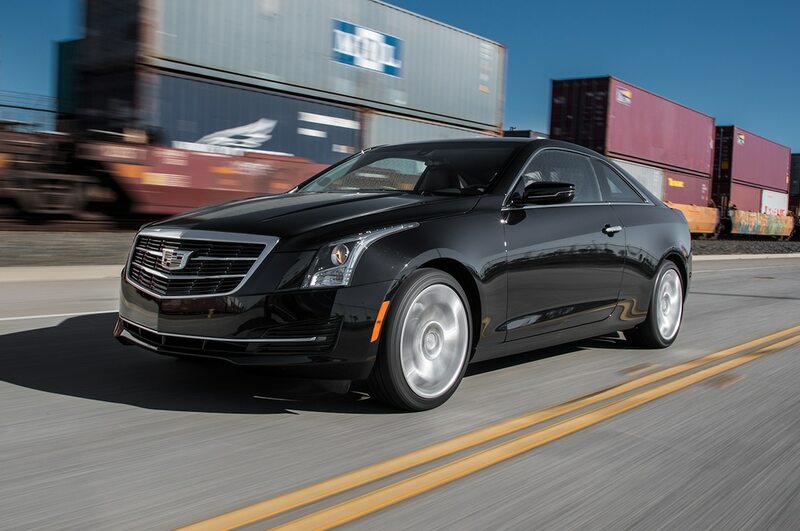 I generally don’t turn off any of the nannies while on the street, but with the Cadillac’s traction control, I made an exception. 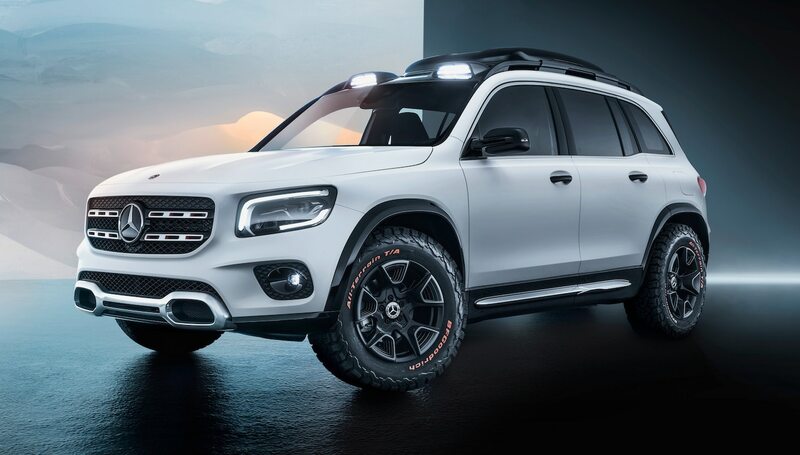 It makes the car drivable on a good road, and you still are protected by the stability control safety net. Budget an extra grand for better tires to make this car handle as it should. 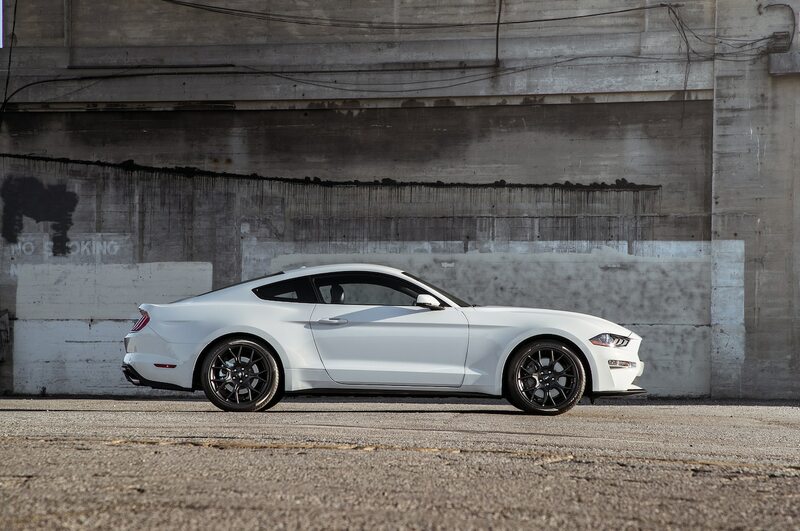 Although the Mustang has vastly superior front-end grip, it’s not perfect. 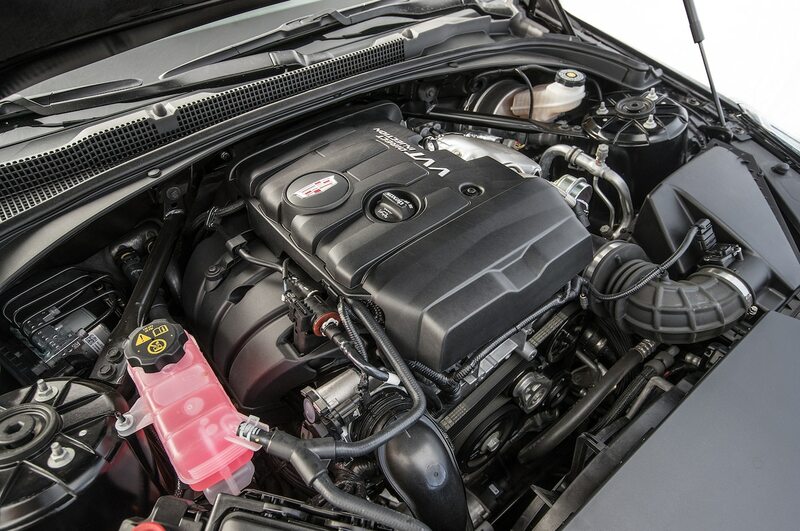 Power tends to come on like a hammer, especially in the various Sport modes, and it’ll easily overwhelm the rear tires and rouse the stability control. 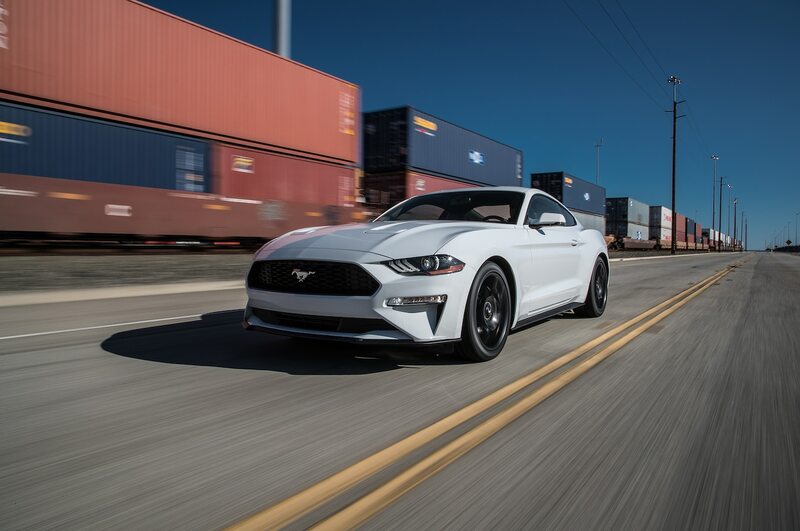 Mustangs like to snap oversteer and need to be driven with finesse, and the little-engine model is no exception. 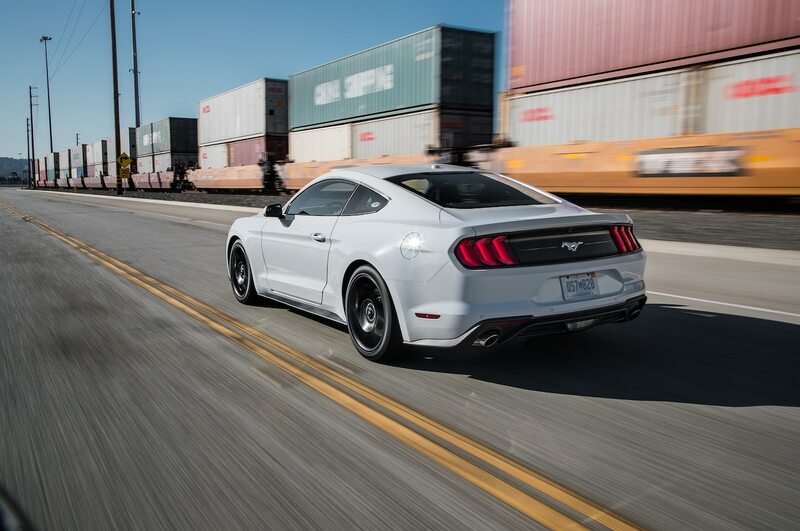 Drive it like you stole it, and it’s like trying to wheel a classic Mustang in Bullitt. 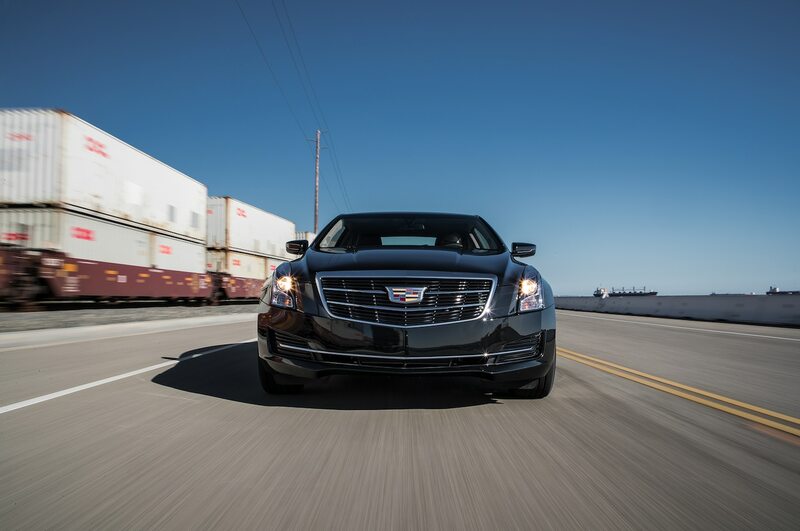 Learn its bad habits, and on a mountain road it’ll leave the ATS for dead. 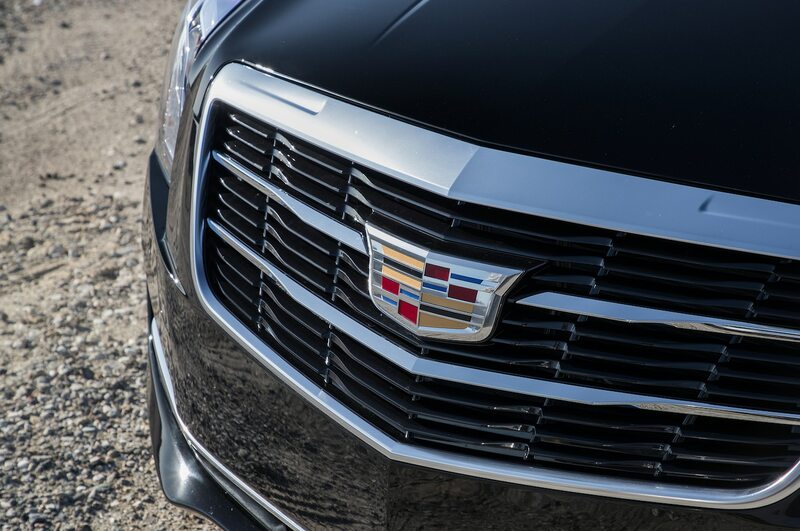 In everyday driving, there’s no denying the Ford feels quicker and sportier than the Cadillac. 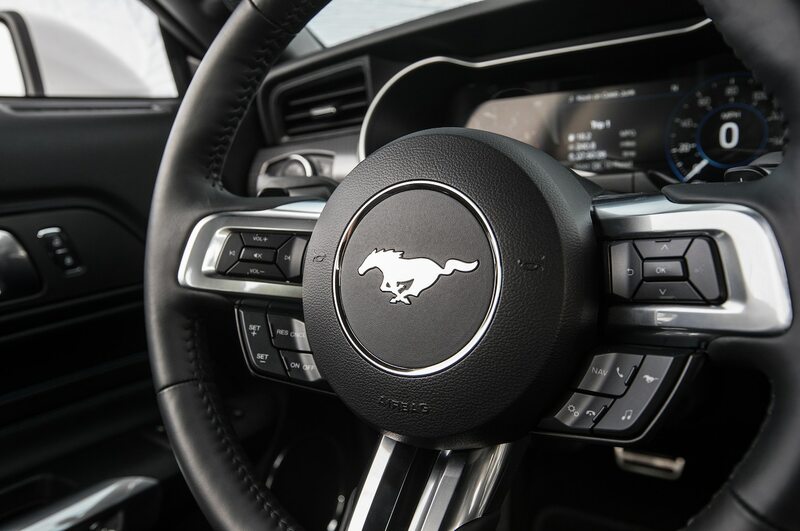 The Mustang’s all-new 10-speed automatic transmission also contributes to its performance. It was brilliant on the road. 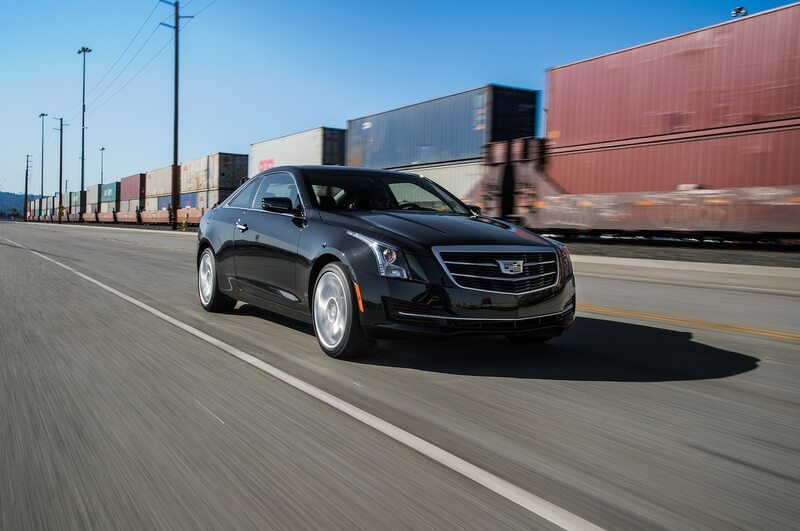 The shifts were smoother and quicker than the Cadillac’s, both up and down, and it always knew what gear to be in. 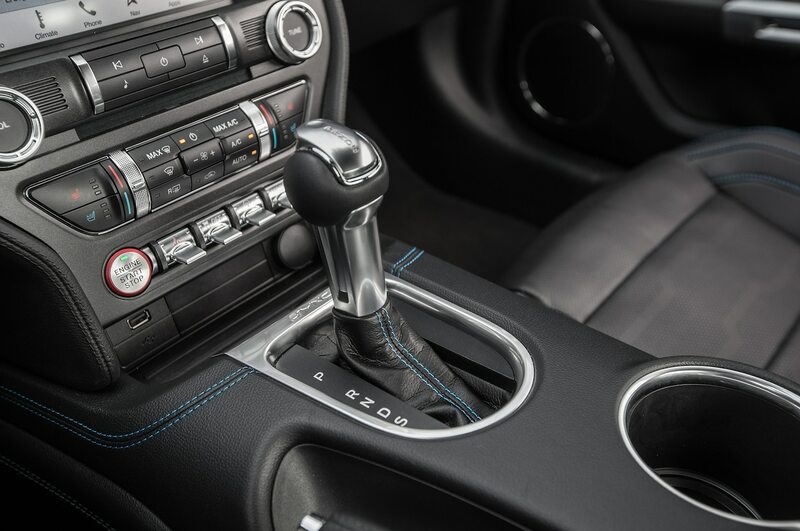 In Sport mode, it behaved so well that it made the paddle shifters superfluous. 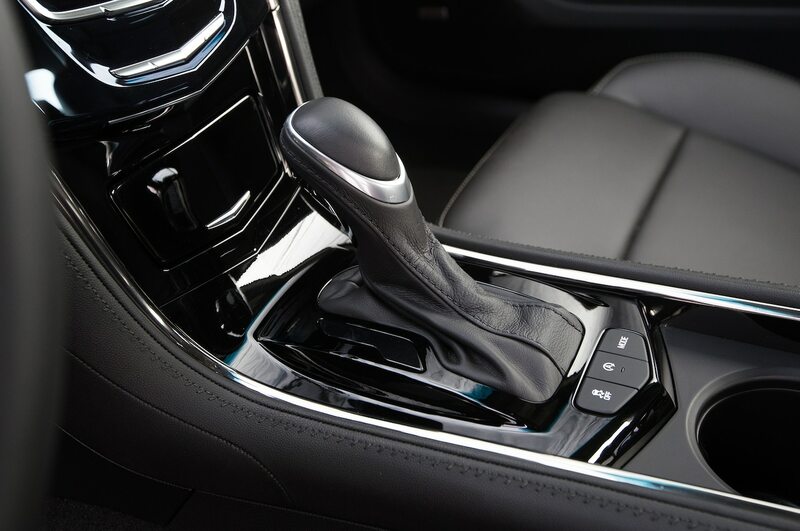 The eight-speed automatic in the ATS was the opposite. 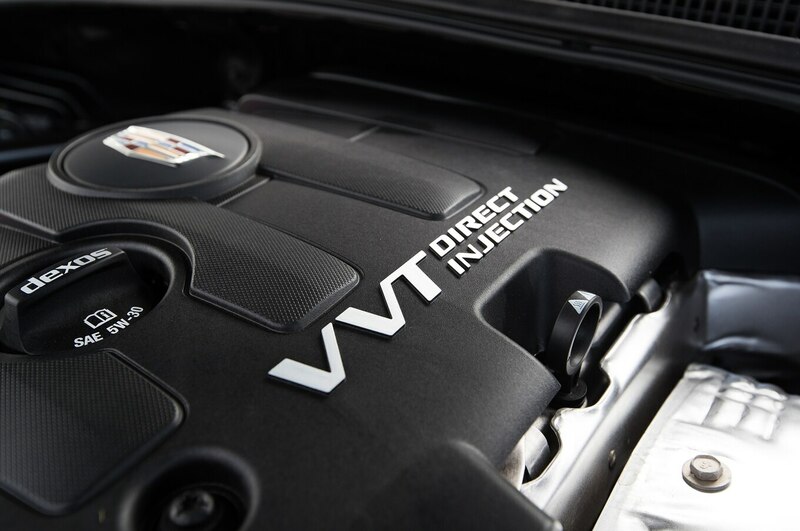 It shifts smoothly but wants to be in eighth gear regardless of drive mode. 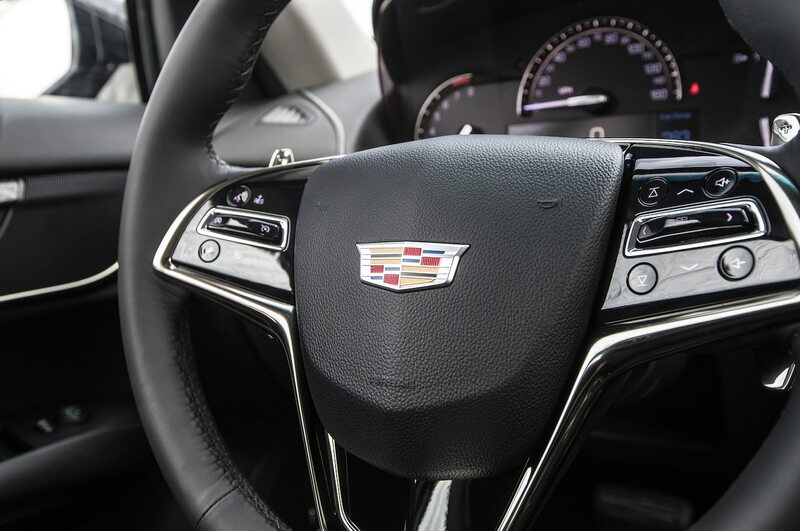 You need to use the paddles to drive the Cadillac quickly, but even they respond slowly. 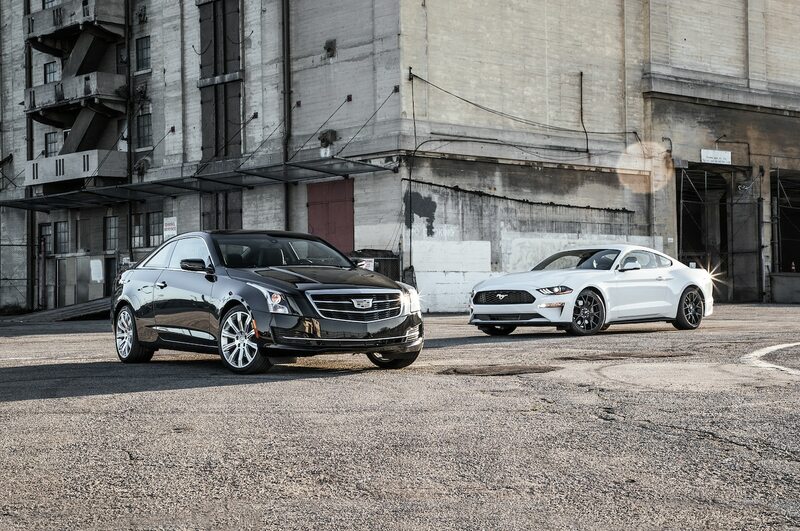 Despite the Mustang outperforming the ATS, we could never find an ideal setup. 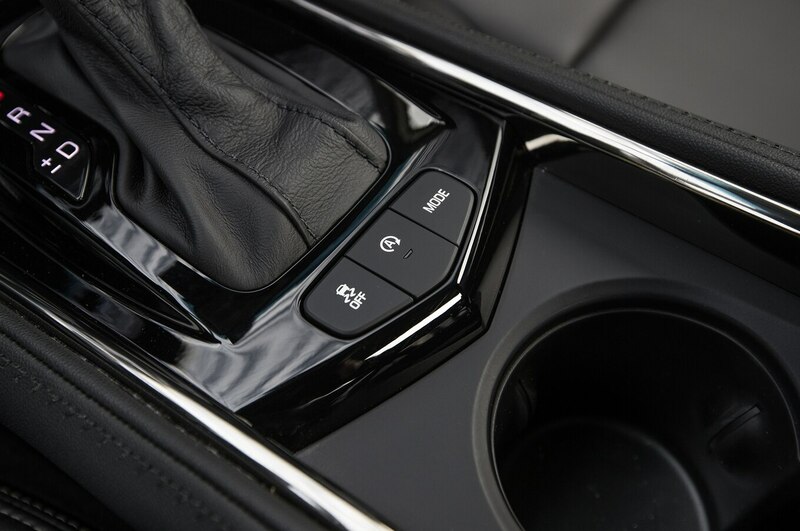 The damper settings are permanently tied to the multiple-choice driving modes, and the steering weight is adjustable only in some modes. As a result, we ended up in Sport mode—where the dampers are too soft but the steering isn’t ridiculously heavy and the throttle isn’t hair-trigger. Even the customizable My mode wouldn’t let us mix and match settings the way we wanted. 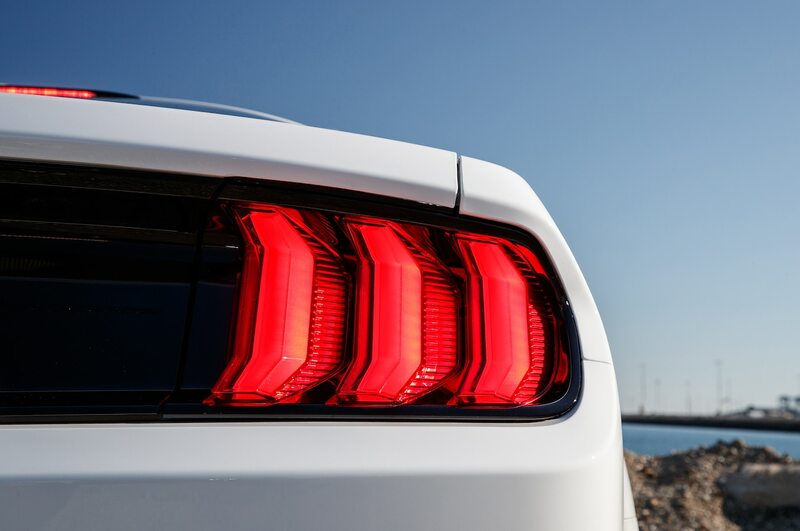 Still, the Mustang, as equipped, is clearly the better sports car. But which is the better luxury car? Here, the race tightens. 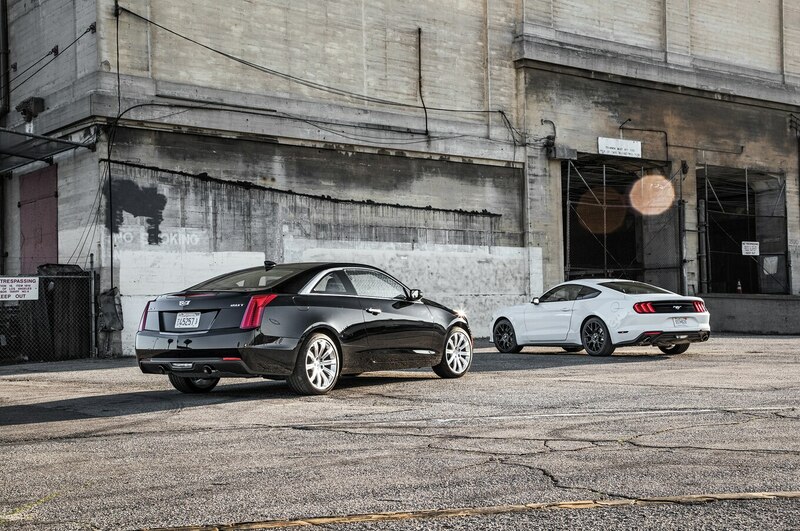 The Mustang registers the loudest interior of all eight cars in this comparison, but the Cadillac’s is the second loudest. 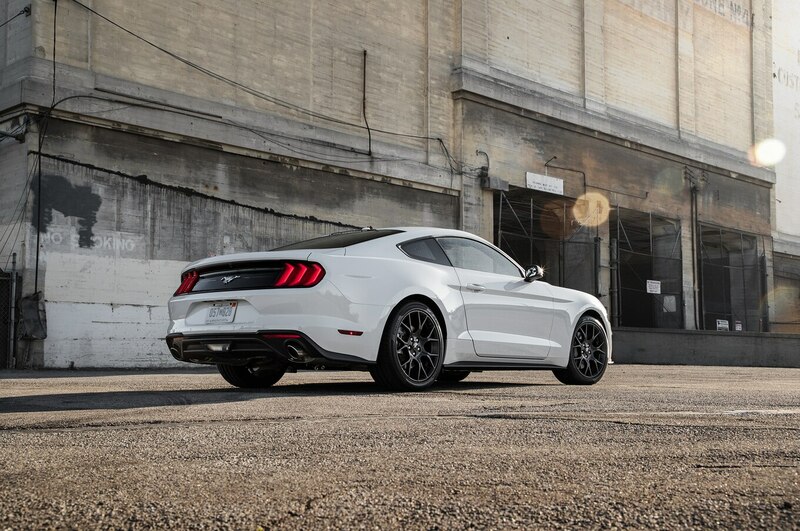 Likewise, the Mustang, despite its optional MagneRide active dampers, rides more like a sports car than the luxury-oriented Cadillac. 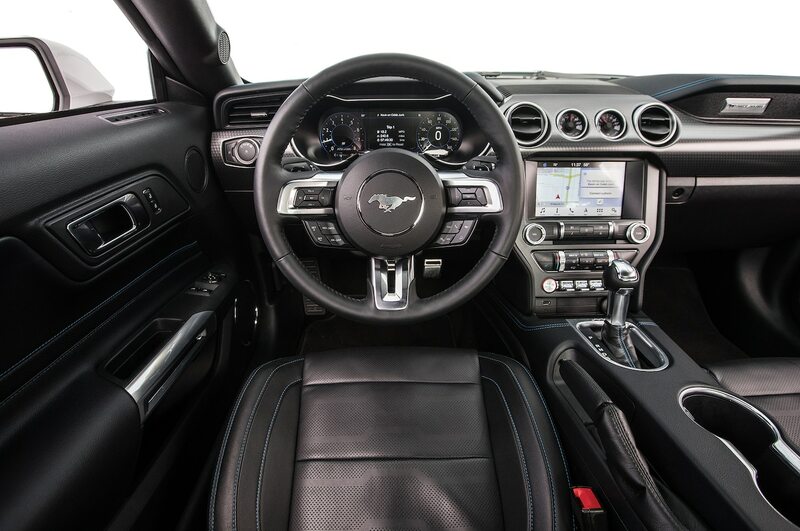 Despite that, we still prefer the Mustang’s cabin. 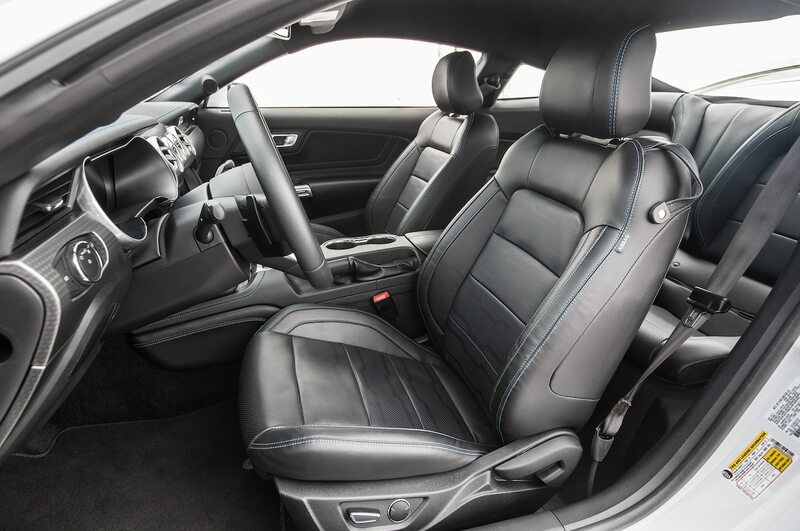 We admire Cadillac’s commitment to “cut and sewn” materials, but we take issue with the materials chosen to cut and sew. 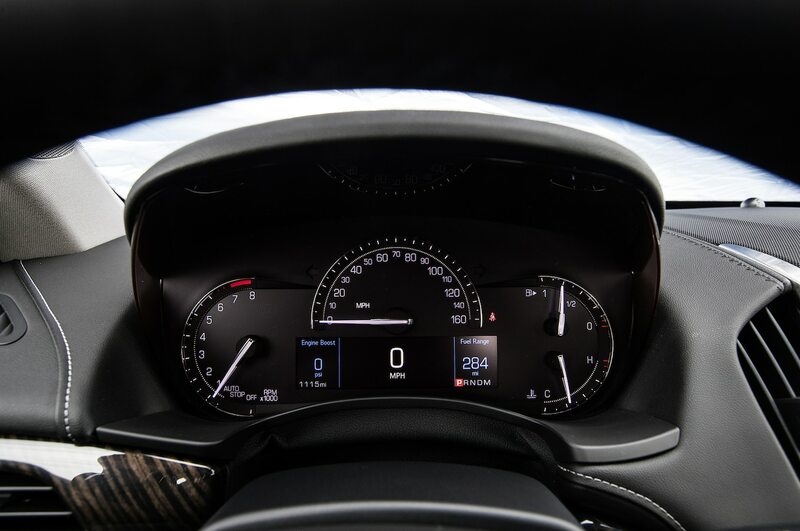 The sheets of vinyl stitched to the dash call quite a bit of attention to themselves, and not the good kind. If you’re not going to wrap the dash in leather or suede, don’t bother. 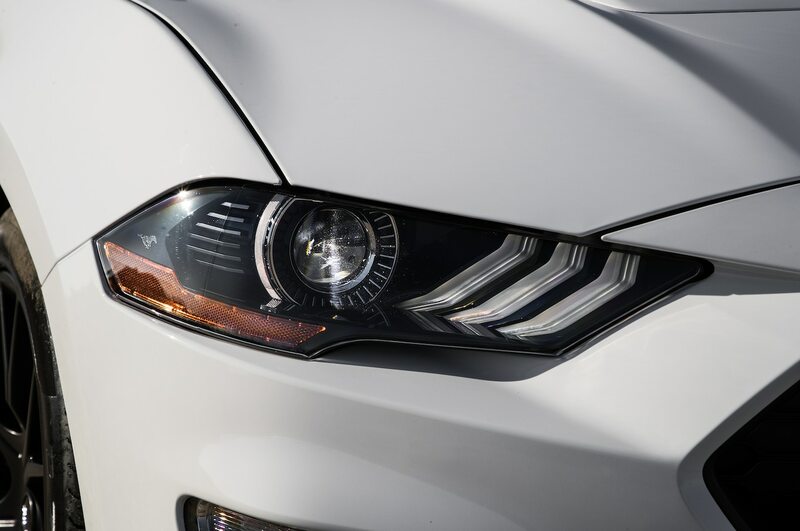 The Mustang’s soft-touch dash is plastic, but it doesn’t look like it’s trying too hard. 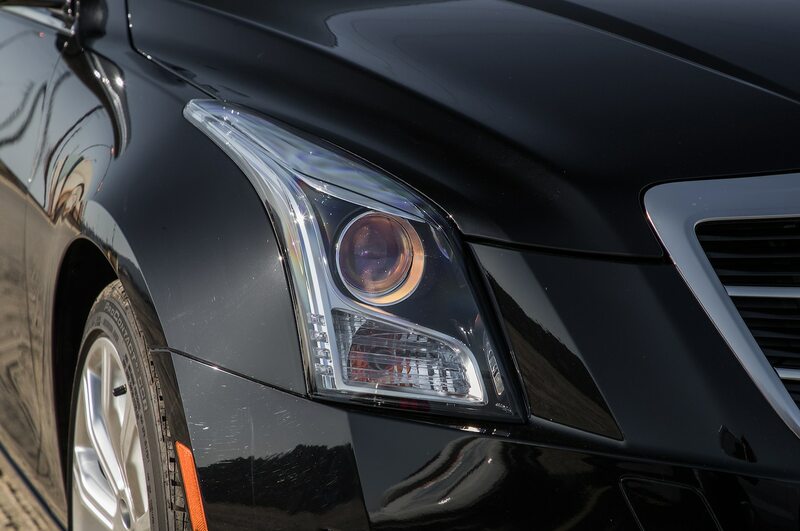 We’re calling a draw on the Cadillac’s plastic wood trim versus the Ford’s dull gray plastic. 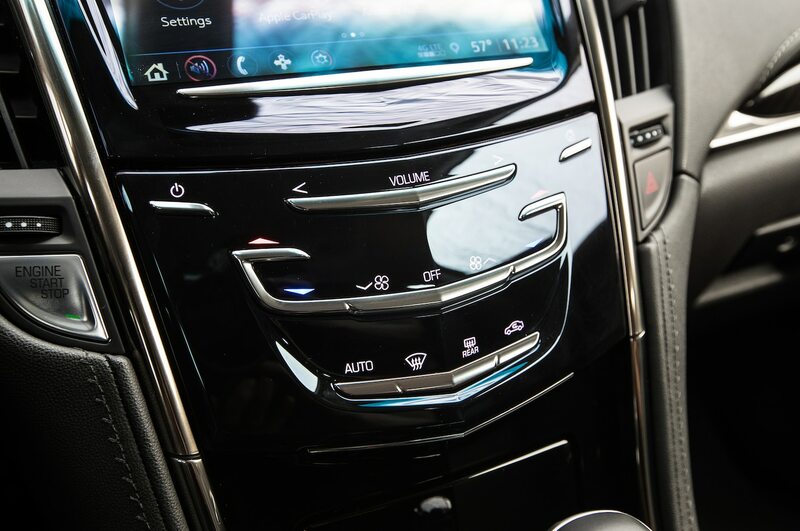 Elsewhere on the dash, we come to a tale of two infotainment systems. Both have long suffered software development issues, and both seem to have finally gotten it right. We find Ford’s Sync 3 more intuitive than Cadillac’s CUE, but the latter looks more hip and modern. 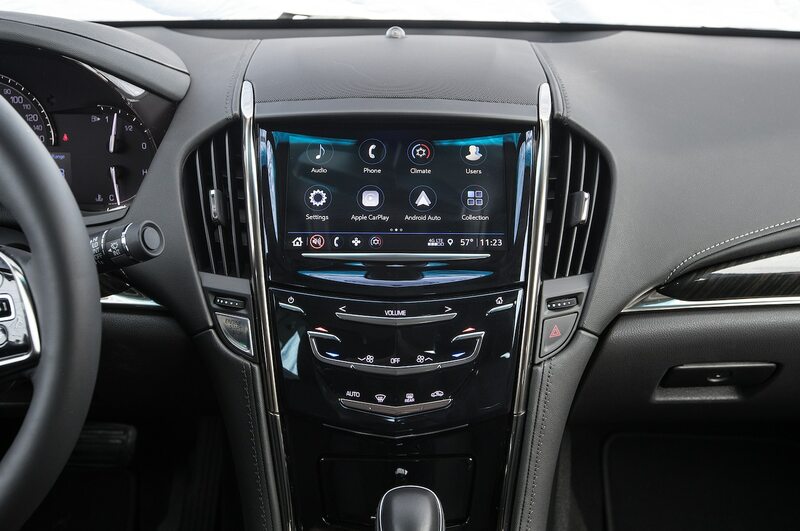 The Cadillac’s lack of navigation is to be expected at this price and is mitigated by Apple CarPlay and Android Auto integration. (Ford provides both, as well.) 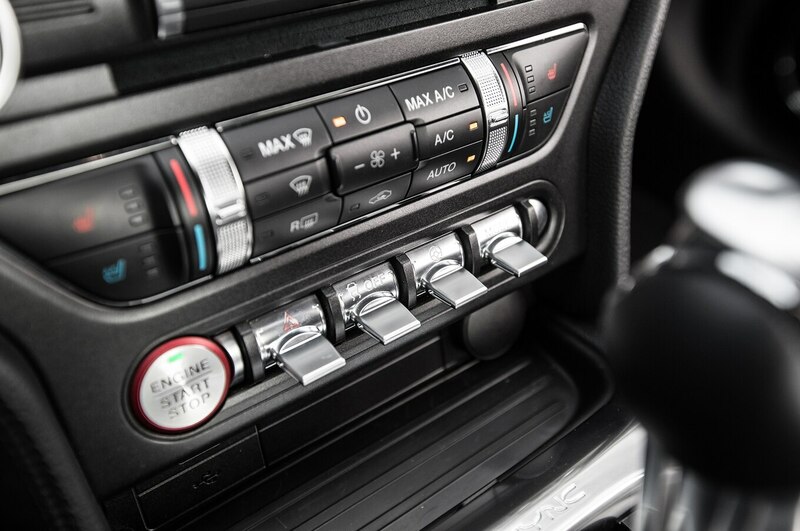 Unfortunately, there’s no getting around the fact that CUE’s entirely touch-sensitive interface is housed in a waterfall of black plastic cascading down the dashboard while the Mustang gets cool metal toggle switches and knurled knobs. 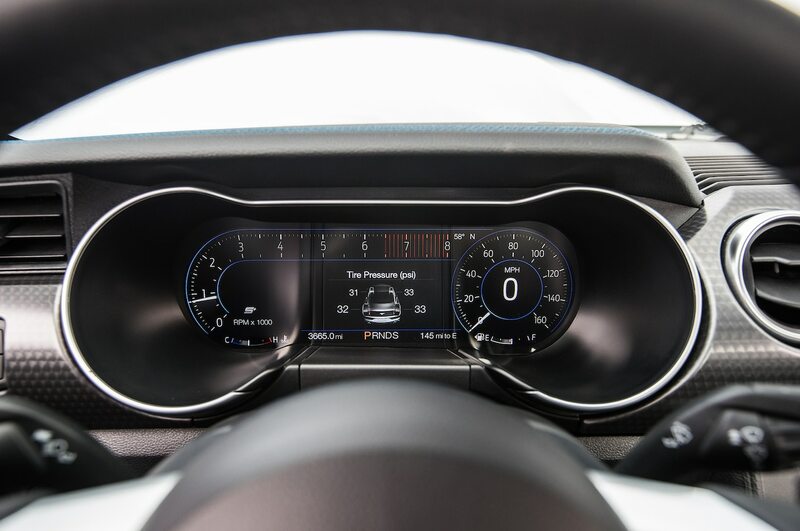 Likewise, the ’90s-inspired gauges in the ATS look dated next to the Mustang’s futuristic-looking digital gauges. 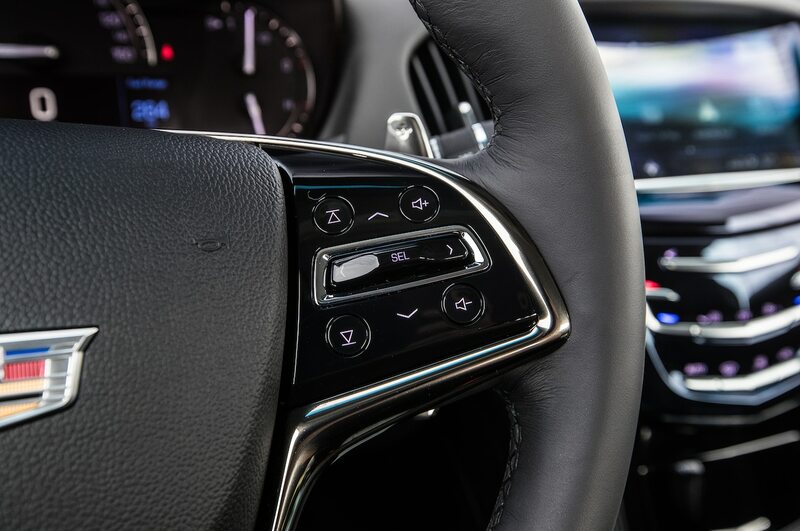 Although Ford’s interface might look better, with layer upon layer of menus and multiple buttons scattered around the steering wheel, it’s a lot less intuitive than the Cadillac’s. 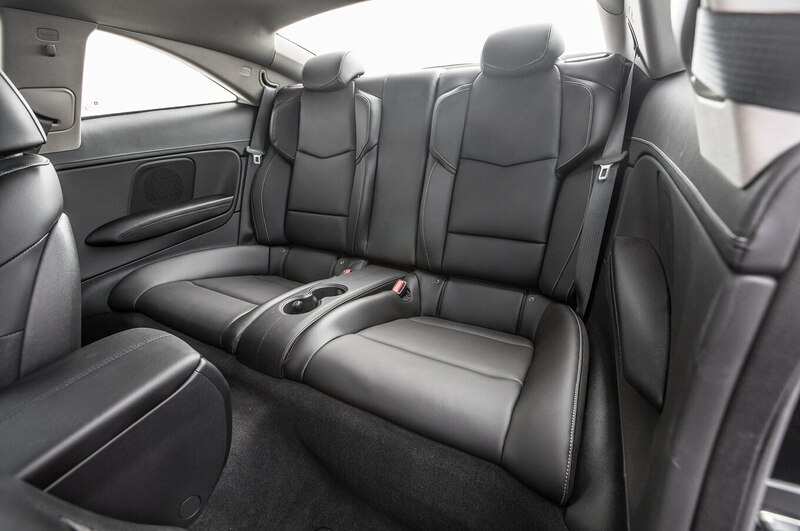 The extra room in the front of the Ford is appreciated, but it makes the rear seats less useful. 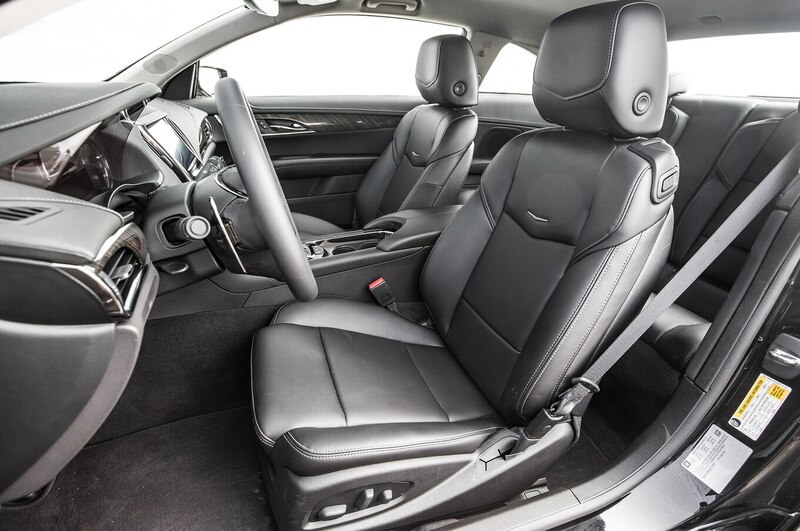 To be fair, the Cadillac’s rear seats are only slightly more utile. Kids only in the back for both. Don’t bring too much stuff with you, either, because neither car has a big trunk. 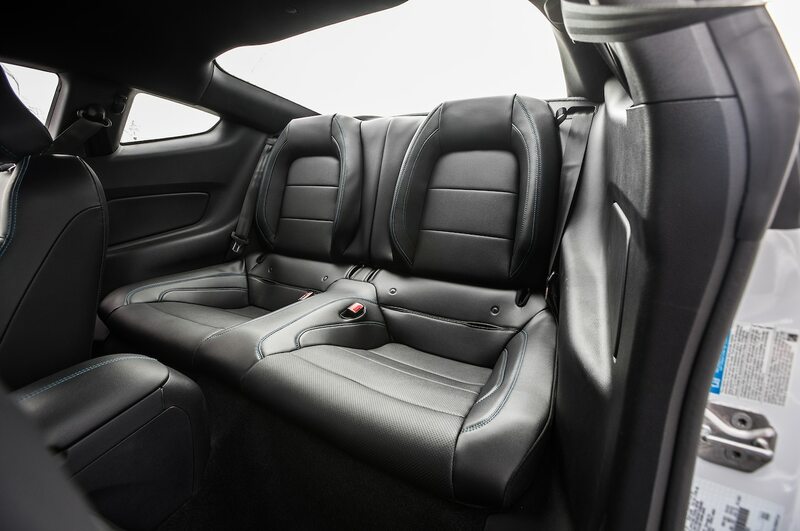 The ATS has a larger opening to get your bags through, but the Mustang has a larger and more usable trunk because it doesn’t have the ATS’ intruding wheelwells. Then there are the money matters. 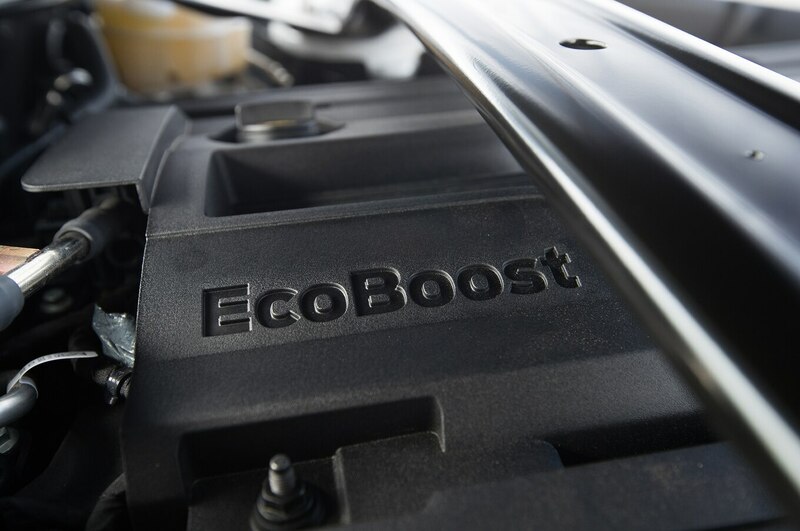 Nearly identical as-tested prices mean nearly identical financing costs, and the same goes for fuel economy. 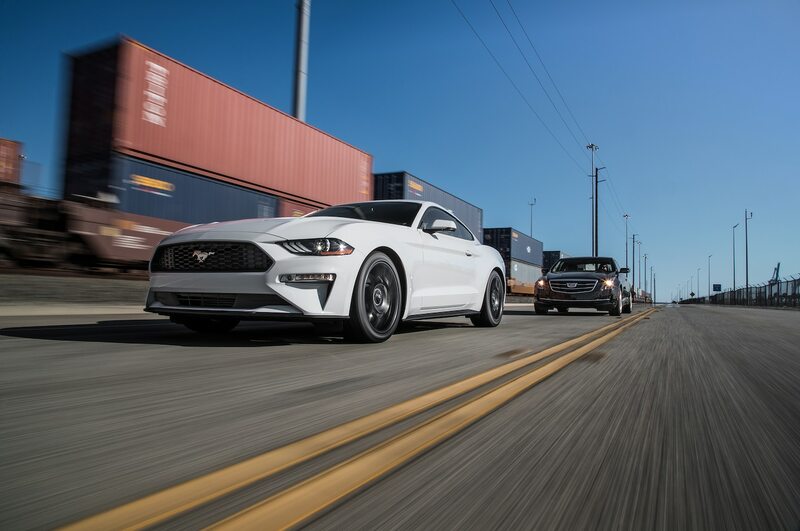 Of all eight cars in this test, the Mustang is the most expensive vehicle to insure, but the ATS is second-worst by a slim margin. 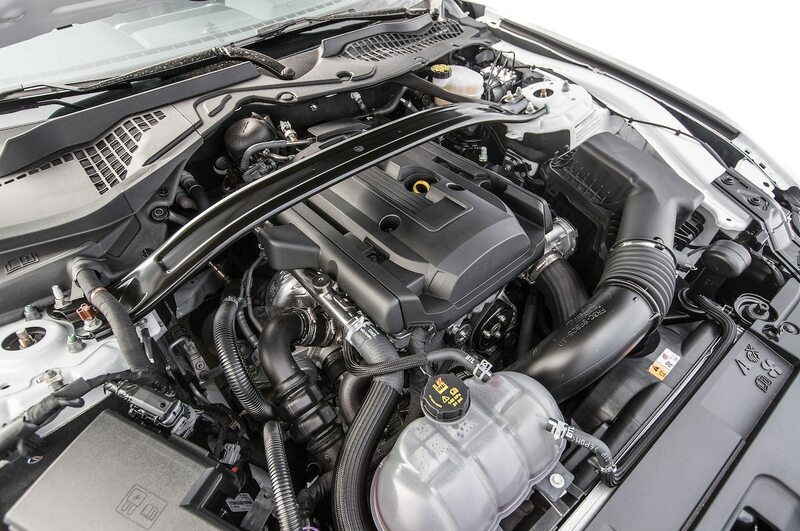 Maintaining the Cadillac is more expensive, but the Ford’s repair costs are steep. The real difference, and it’s a doozy, is in depreciation. 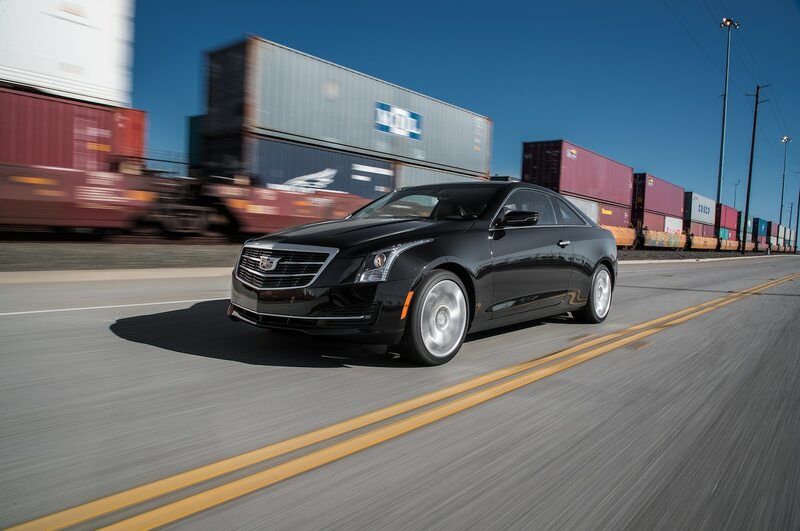 The Cadillac has the worst depreciation in this test; the Ford comes in at the average. So it went and so it goes with these two. 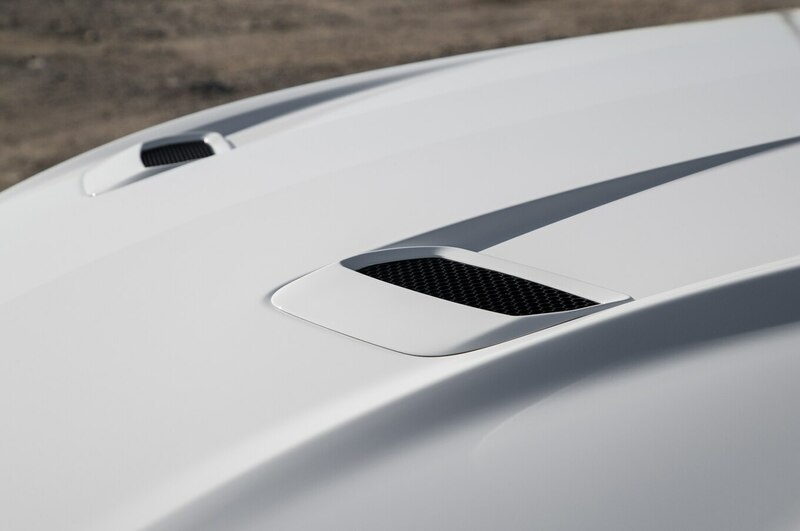 Neither is our ideal four-seat sports car, nor is either a standout luxury car. 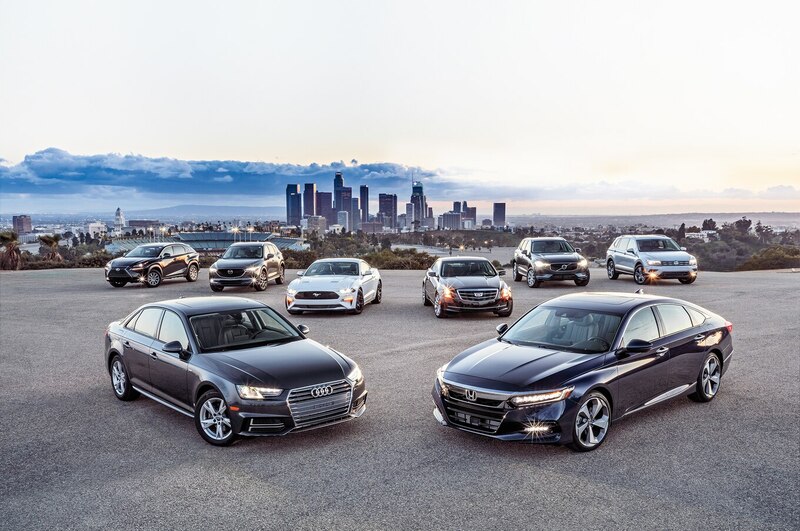 With two equally priced cars, the decision then comes down to which we’d rather drive. 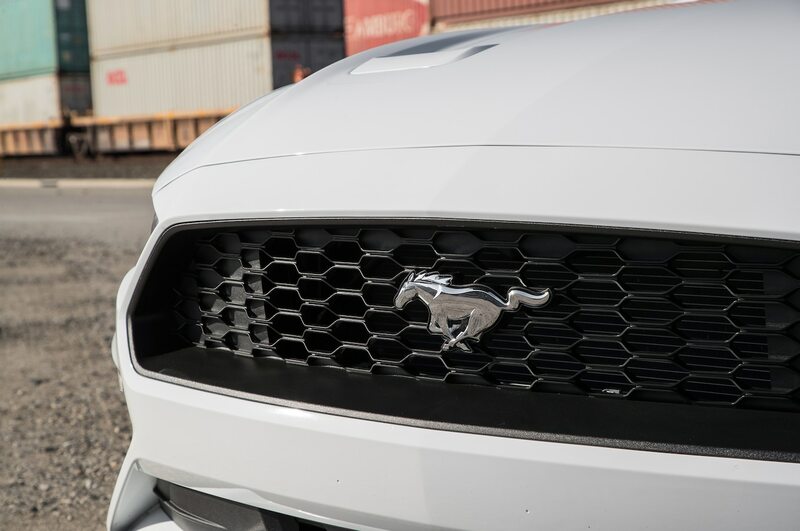 With better performance, a better driving experience, far more features, a nicer cabin, and a cheaper cost of ownership, the answer is inescapably Mustang.